For the first time in both team’s history, the storied rivalry between the Rangers (17-6-2) will take on the New York Islanders (13-8-4) in a stadium other than the Nassau Coliseum, traveling a few boroughs over to Brooklyn and the Barclays Center instead. A smaller venue with some obstructed view seats and the chance to get really loud, the environment should be extremely lively, with fans of both teams shouting and cheering for their respective teams. It hasn’t been the best of starts for the Islanders in their new home. Despite last season’s success and their young, talented roster, the attendance has been pretty poor. They average 12,393 fans per game, which is 29th in the league, and the numbers occasionally dip around 11,000 too. Part of this has to do with the many obstructed view seats, where an entire third of the ice can be blocked out, the high concession and ticket prices, and the long trip for Long Island fans into Brooklyn. But tonight, the stadium will almost certainly be full. Ranger fans travel extremely well, and they’ll take the opportunity of an empty stadium to make it as close to a home game as possible. The atmosphere will be electric. This is the biggest game at Barclays to date. This is the first game of the season between the Rangers and Islanders, and the first of two games at the Islanders new home this season. The Rangers currently hold a slim lead in the Metropolitan Division, and a six point lead over the Islanders, so this matchup is important for the standings too. 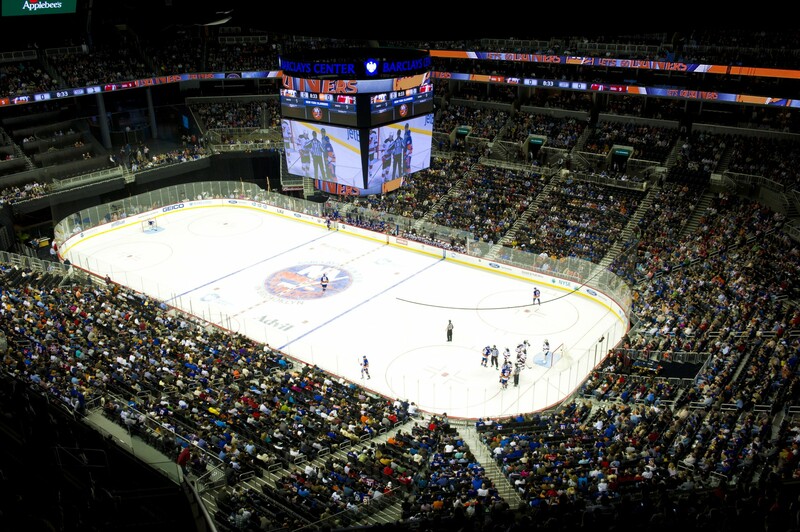 A photo of the Barclays Center from a preseason matchup against the Devils. The Islanders won the season series last year, taking three of the five games against the Blueshirts, winning both games at MSG and just one at home. The Rangers have picked up at least one point in 14 of the last 19 games against the Isles dating back to November 15, 2001 (12-5-2). They’ve also earned at least a point in eight of the nine road games against the Isles in that same span (7-1-1). The Islanders have been playing well as of late, winning three of their last four games, including a 5-3 win over the Avalanche on Sunday. John Tavares continues to lead this team, tallying 21 points (11-10-21) in 22 games this year. His counterpart, Kyle Okposo, is also enjoying a good start, putting up 20 points (6-14-20) so far, while Frans Nielsen has contributed 19 points (9-10-19). Jack Capuano has used a two goalie system this season, using both Jaroslav Halak and Thomas Greiss equally. After Greiss started and won the last two games, Jaroslav Halak (6-4-2) will start in net. He’s been very good so far, posting a .921 save percentage and a 2.02 GAA. Halak was masterful against the Rangers last season posting a 3-2-0 record with a .931 save percentage and a 2.41 GAA, along with a shutout and two victories at Madison Square Garden. This game couldn’t have come at a better time for the Rangers. They got a big win against the Hurricanes on Monday, but blew a 4-1 lead. It ended a three game losing streak, but they still didn’t play that well, getting outshot and outchanced by a large margin. A rivalry matchup and the first game at the Barclays could ignite a fire in the players. Henrik Lundqvist will be back in net after a 33 save performance against the Hurricanes for his 13th win of the season. Last year, Lundqvist lost all three games he played in against the Islanders, allowing 13 goals against in those games. 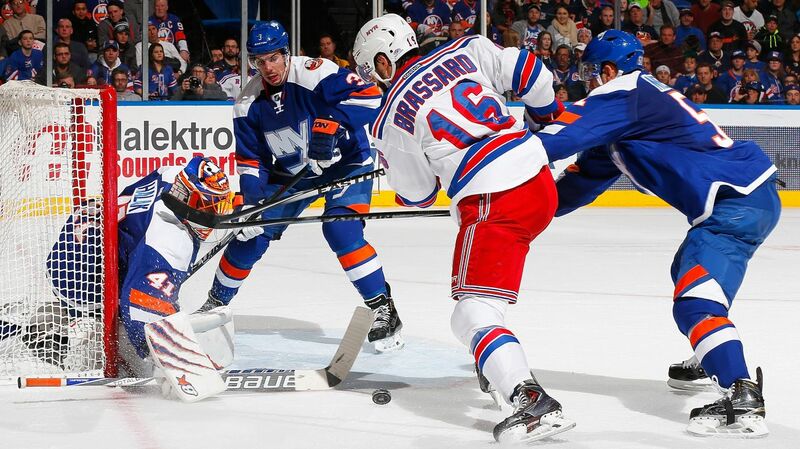 In 50 games against the Isles, Lundqvist is 29-15-5 with a 2.22 GAA, a .921 save percentage and 5 shutouts. The Rangers made their first roster move following the two injuries to Klein and Stepan, recalling Tanner Glass from the Hartford Wolf Pack. Vigneault said that he expects a physical game, and that Glass was playing well in the AHL, and that was the reason for his re-call. He’s also familiar with the system and kills penalties, so that may be other reasons. Emerson Etem is feeling a bit under the weather, so Glass will start tonight against the Islanders. With Hartford, Glass scored two goals with five assists in 17 games, and was a -11. In two games with the Rangers this season, he recorded 11 hits and had no points. With Kevin Klein injured, Dylan McIlrath gets a huge opportunity to prove his worth as an everyday player. He will likely play with Keith Yandle, a pairing that has worked very well. 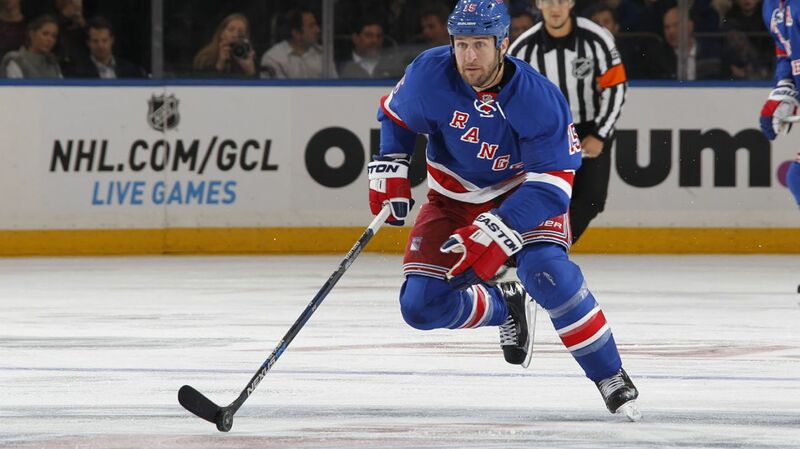 Vigneault needs to use him, and not give him 13 sheltered minutes a game. He’s more than capable of playing a bigger role, and I think that third pairing will have a good game. Mats Zuccarrello scored the first goal of the game against Carolina, giving him 22 points in just 25 games this season. His line has stayed intact, with Rick Nah (8-8-16) and Derick brassard (7-10-17) still by his side. In 22 career games against the Islanders, Rick Nash has recorded 18 points (10-8-18) as well as 10 points (6-4-10) in the last 12 games against them. Derick Brassard has been really good against the Rangers’ now crosstown rivals, tallying 10 points (2-8-10) in 16 career games against them, and seven points (2-5-7) in 11 games since joining the Blueshirts. Chris Kreider finally ended his scoring drought, beating Cam Ward on a bad angle shot for just his fourth goal of the season. The line with Lindberg and Fast, along with Kreider, looked pretty good at times, and they’ll be counted on again for offense. The Rangers and the Islanders will face off at the Barclays Center at 8 PM. The game will be broadcasted on NBCSN. Posted on December 2, 2015, in Game Previews and tagged Alain Vigneault, Antti Raanta, Chris Kreider, Colorado Avalanche, Dan Boyle, Dan Girardi, Derick Brassard, Derick Stepan, Dominic Moore, Dylan McIlrath, Emerson Etem, Henrik Lundqvist, Jarret Stoll, Jesper Fast, JT Miller, Keith Yandle, Kevin Hayes, Kevin Klein, Madison Square Garden, Marc Staal, Mats Zuccarello, Matt Duchene, MSG, Nathan MacKinnon, New York Rangers, New York Rangers blog, NHL three stars, NYR, Oscar Lindberg, Rangers, Rangers blog, Rick Nash, Ryan McDonagh, Stepan injury, Viktor Stalberg. Bookmark the permalink. Leave a comment.